Join New York Times Bestselling author Wanda E. Brunstetter along with Jean Brunstetter in Holmes County for a dramatic new 6-part serial novel. Meet businessman Joel Byler who has gotten himself into a financial bind and his eccentric, wealthy Amish father who is done bailing out his spoiled son. When will Joel learn he most pay for his own mistakes—and at what cost to his business, his fiancée, and his Amish siblings? 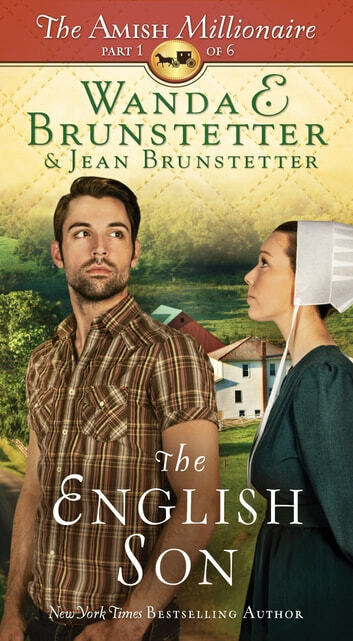 The English Son by Wanda E. Brunstetter and Jean Brunstetter is the first book in The Amish Millionaire series. Joel Byler has just put himself in a financial bind by buying the car of his dreams. It is a 1967 Corvette Stingray (he paid $250,000). Now, though, Joel (a contractor) needs to come up with the money needed to pay his subcontractors for their latest work. Joel has a joint account with his fiancé, Kristi Palmer. They are saving up money for their wedding and a home (he lives in a trailer). They agreed never to take money out of the account without discussing it with the other person. Joel does not want to tell Kristi about the car (and is hiding it at his workshop). Joel decides to take the money from the account, but it will not pay all of his subcontractors. Joel decides to go home and ask his father for the additional money. Joel left his family seven years ago. Joel was raised in Berlin, Ohio in an Amish family. He was never satisfied with that life (always wanted what he did not have). Joel’s father, Eustace is still grieving the death of his wife. He misses his son and wants to help him, but he does not think that money is the answer. Kristi is worried about Joel. She can tell that something is wrong, but he refuses to talk to her. What is going to happen to Joel? The English Son is well-written and enjoyable to read (I read it straight through). I did not want the book to end (I wanted more). The English Son ends with a cliffhanger and we have to wait for The Stubborn Father to find out what happens next. I give The English Son 5 out of 5 stars. I have only given you a brief overview of the book (there are other family members who have their own lives and issues). I am impatient for the next book in The Amish Millionaire series. I received a complimentary copy of The English Son from NetGalley in exchange for an honest review.